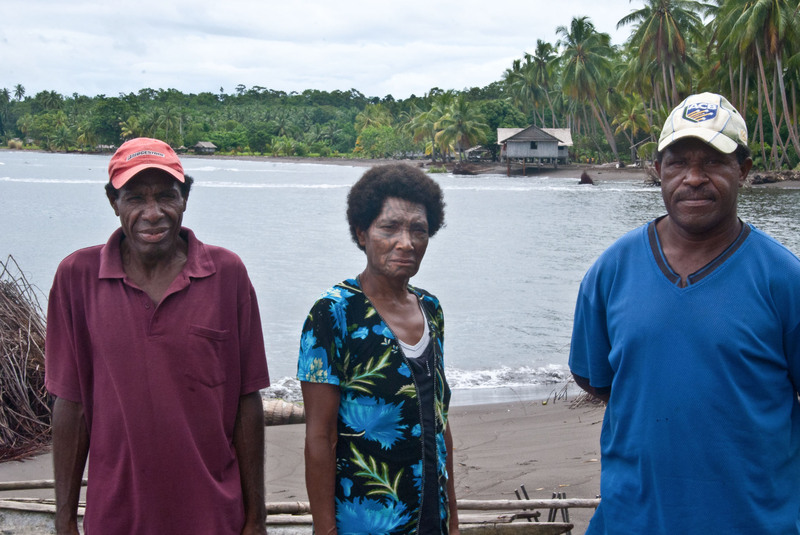 ”Now we can’t live on the beach anymore.” Members of the Kanare family are looking at the wide opening in the middle of the beach. The water is calm now, but on January 9th a flashflood coming down the valley broke through the beach from behind and thirteen families lost their houses, their homes. 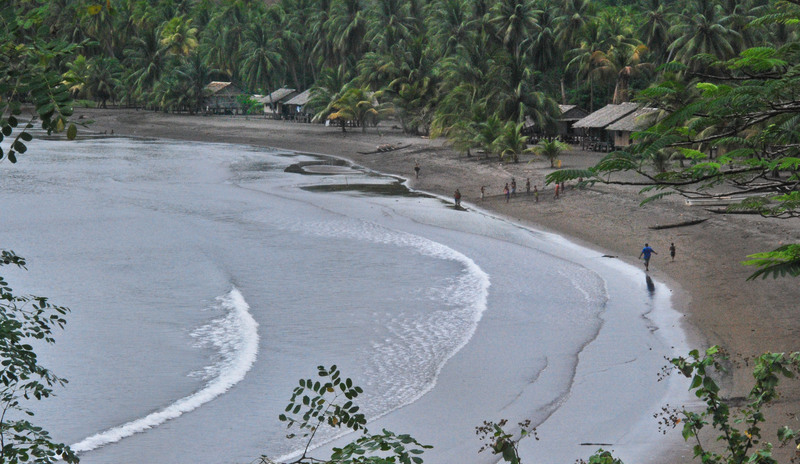 It had rained heavily for a couple of days at Tumari, and with a record-high king tide and the heavy breakers hitting hard the beach started crumbling and giving way all along the bay. At the same time the river came roaring down from the back and more and more water gathered in the lagoon behind the beach. 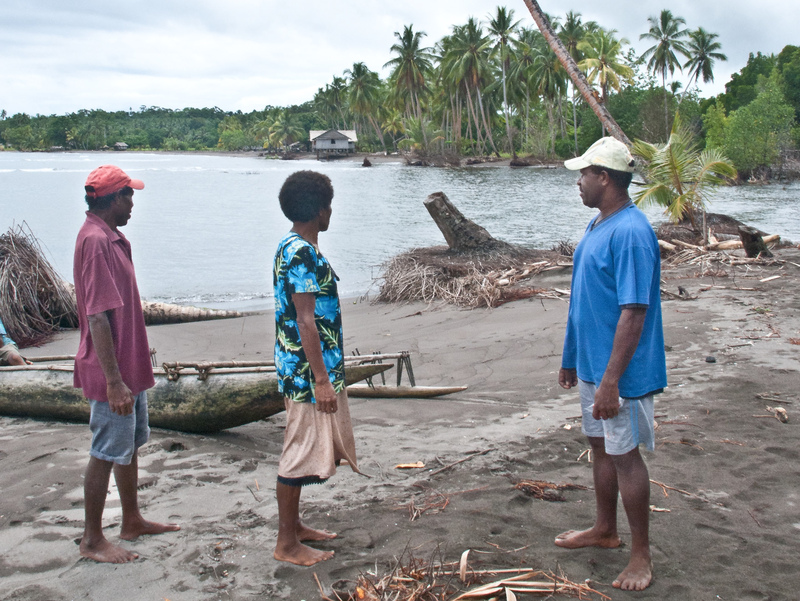 In the afternoon of the 9th the rain got even more intense and the water level behind their houses rose dangerously – they realized the beach would be flooded. 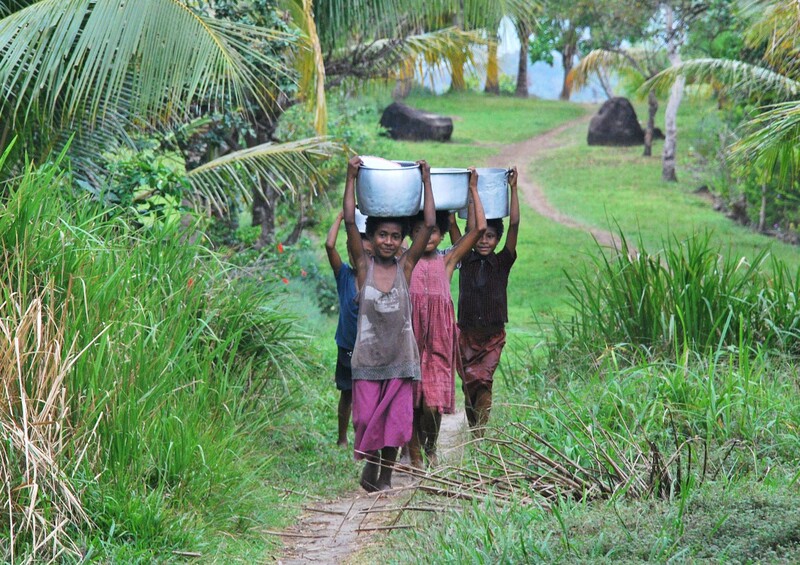 The women and children got in to the dinghies that were around, the men tying them to the coconut palms. At 9pm hell broke loose. The water from the back was suddenly flushing over the beach in all its length, under their houses, and chewing away the sand where it met with the breakers. At the northern end the water pushed through, braking three houses, washing them out to the sea. Oswald, the ward counselor, and his family were the first to see their house go. Just a few minutes later came the big opening in the middle of the beach; an avalanche of water taking the sand, eight houses, and all the belongings of the Kenare families into the ocean. Just like that – all gone! A couple of hours after midnight the water started to go down, but before that they had called to friends and government representatives in Popondetta, the provincial capital, to let people know, and from there the news was put on Facebook right away. Some things have changed around Tufi. 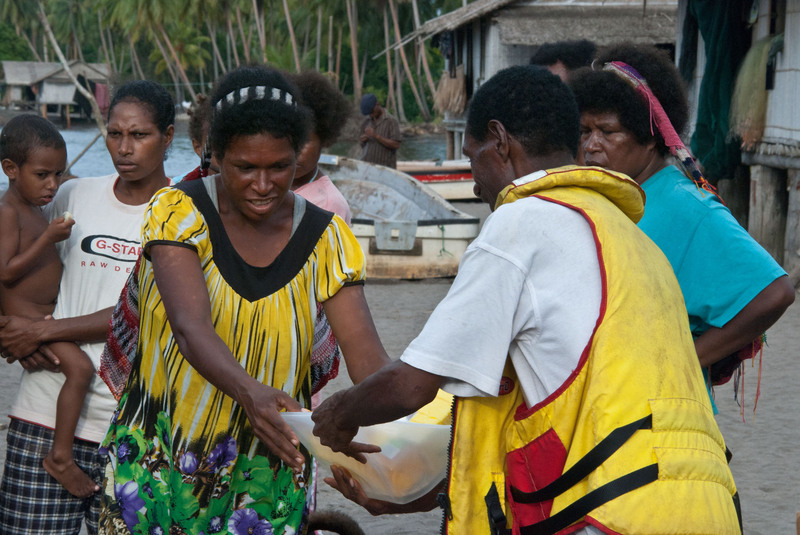 When I visited Tumari in March the Red Cross arrived with food supplies. 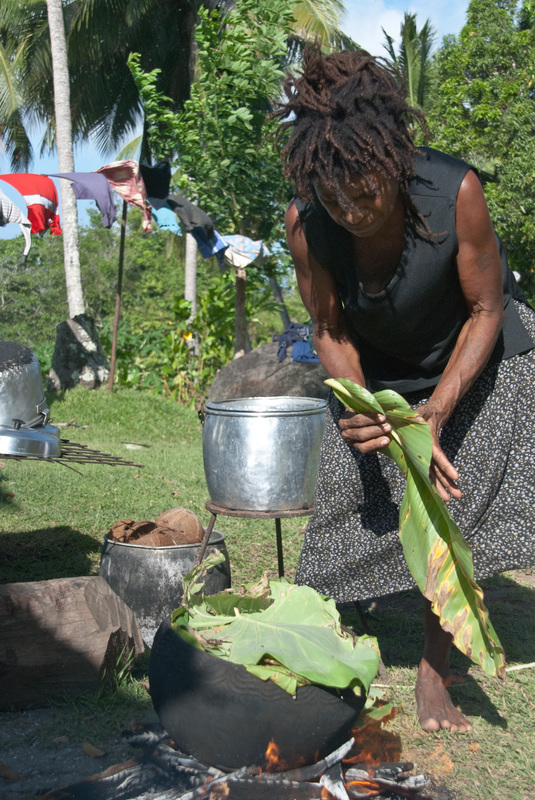 Most of the Tumari gardens had been completely demolished – only the sago and coconut palms could still give them food. Help was late, despite the calls sent out right away. It took two full weeks before the first aid shipment arrived (and this was by a donation from the Kokoda Tracking Foundation – cheers to them!). I witnessed a well organized handing out of supplies – rice, cooking oil, etc – to all families, and John, the Red Cross team leader, informed them that they would return shortly to make a long term assessment of their needs. The community leaders had also come together to solve the housing situation, and land was now being cleared up on higher ground behind the school. There will be 22 houses – everyone on the beach will be moving up. 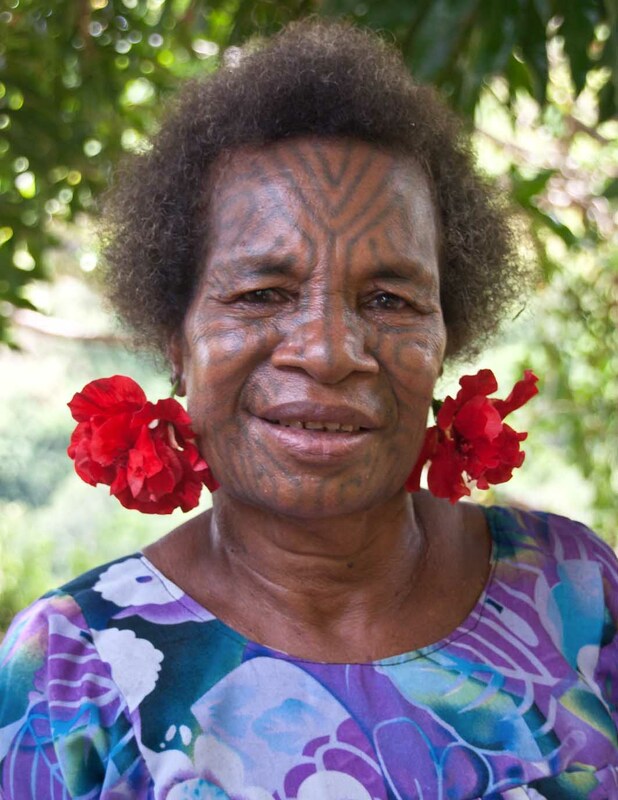 In my book, Beautiful Tufi, I wrote about how the Tumari people were responding to the higher tides, but now they were hit from behind instead. Is that how climate change is going to hit us all one day: by surprise – even from behind! Half a year has passed since I visited Tumari, and I know that several families have moved up to their new homes now. 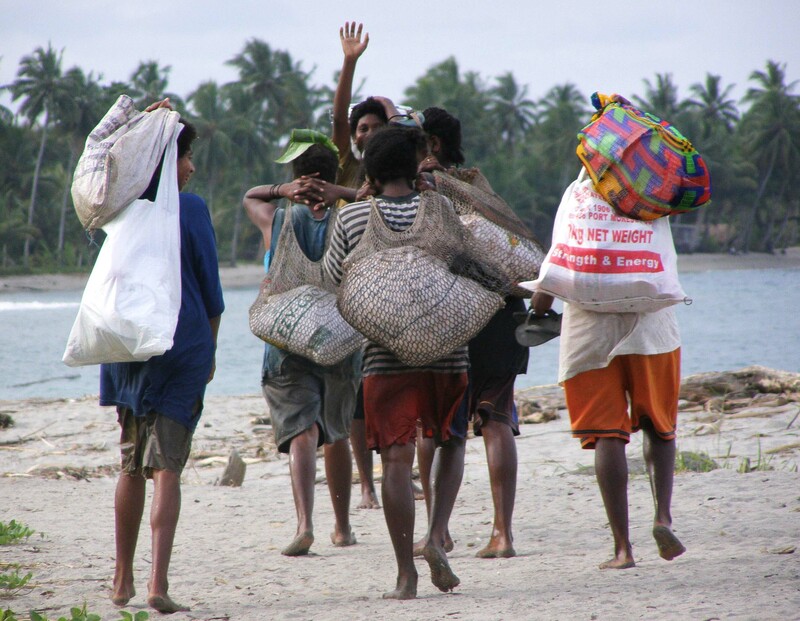 The Tumari people are strong and they will stay on their feet, but their beautiful village on the beach is gone forever. 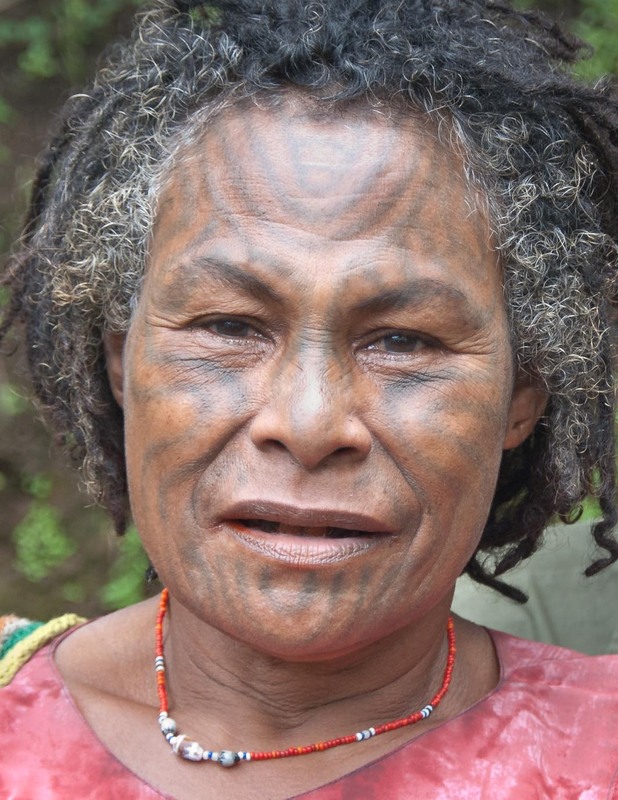 When a Tufi girl is ready for marriage she might, for some weeks, enter the hibernating process of getting a facial tattoo. 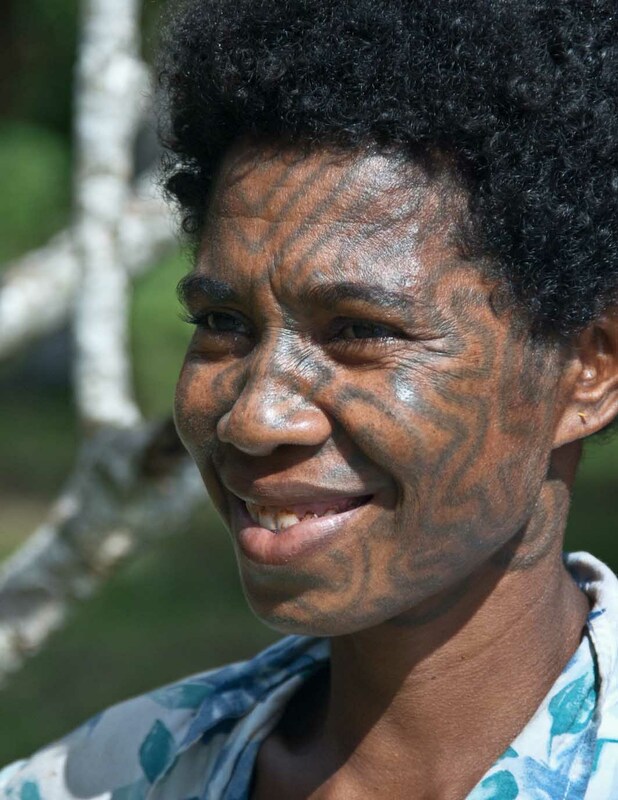 The tattooing is an old traditional practice that has faded away and disappeared in most communities, but there are some areas where the tradition lives on. 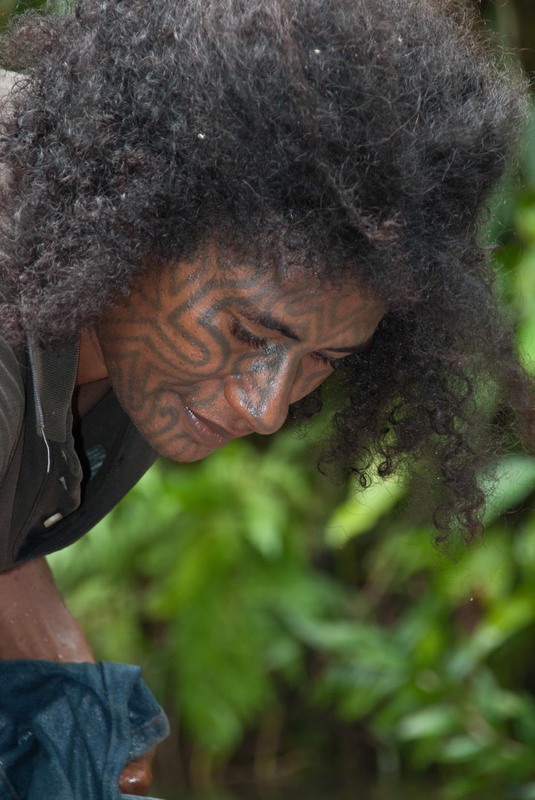 A hundred years ago tattooing was common all over Papua New Guinea. Most places it was only for the women. The method was basically the same everywhere, but the patterns and what areas would be marked varied between the different areas. 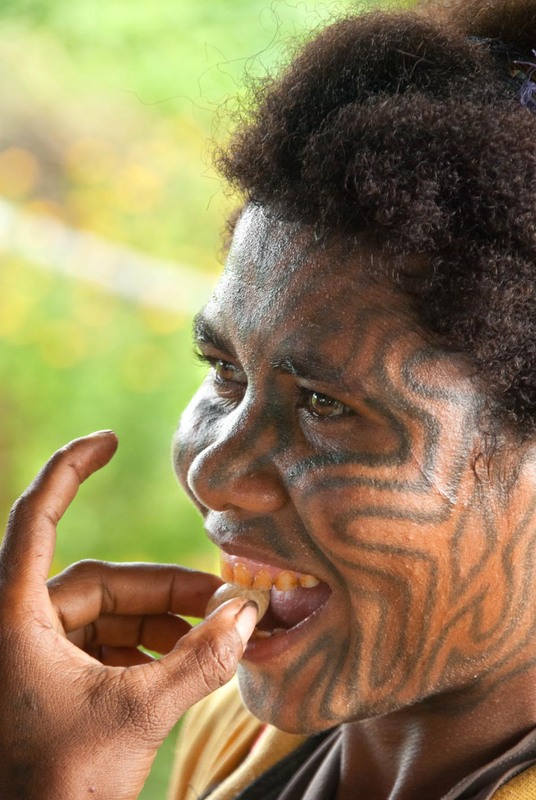 Some had their whole bodies tattooed, starting with a section at a young age, then adding some every year, and the final needle applied around puberty. At Tufi it was the face and sometimes the neck, and some would – only for the husbands to view – have their thighs tattooed as well. First you take your fire wood and arrange it in a star-like manner so that it will be a solid resting place for your pot. When it’s there in place, you line it with some banana leaves and then start filling it up with vegetables. 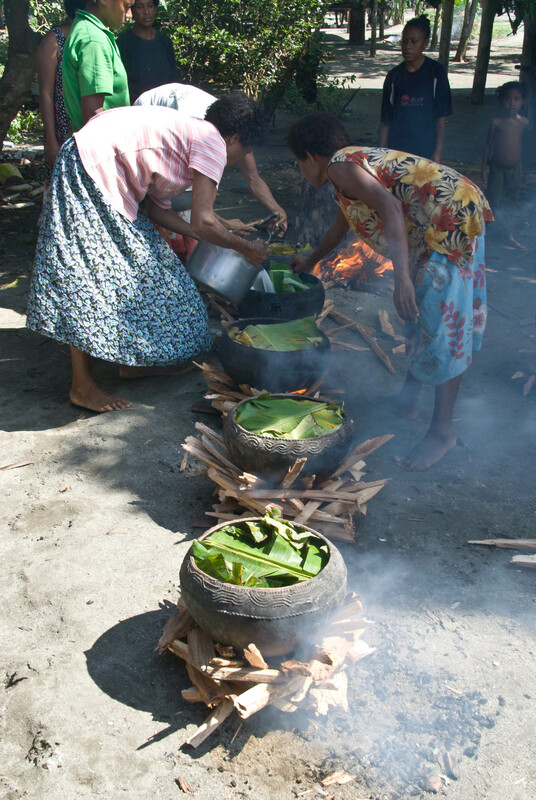 The ones that need the most time to get properly cooked, usually the taro, you place on the bottom. Then you add the water, and maybe some coconut milk. 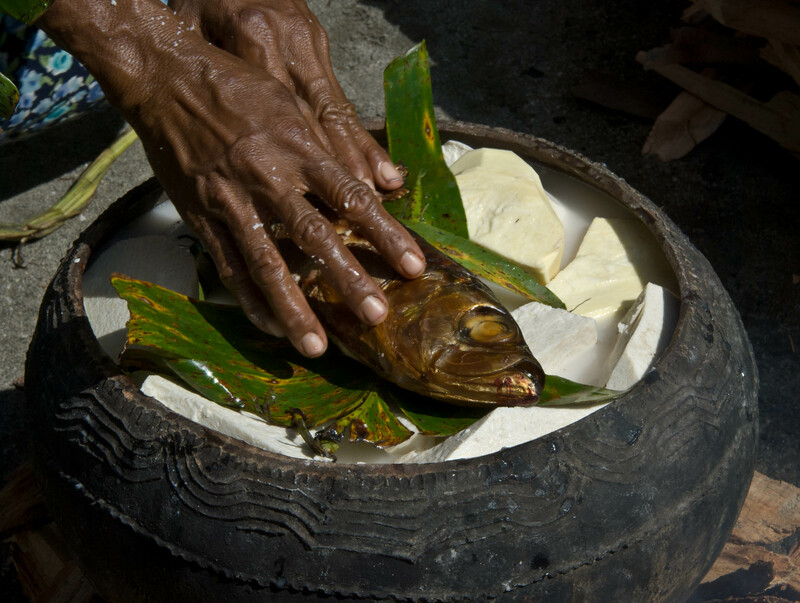 On top comes fish or meat, before you place taro or banana leaves as a cover on top. Now you only have to make sure that the fire keeps going. here both the pot making and the trading is still very much alive. 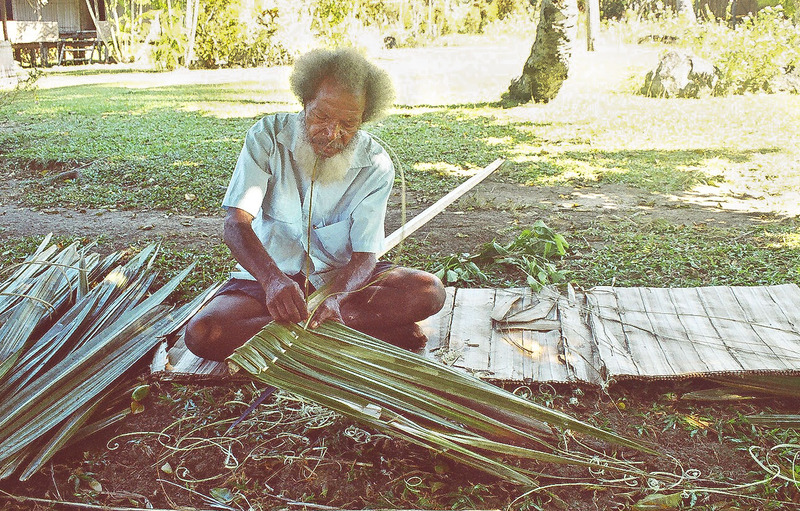 south trade their tapa (bark) cloth, and the Cape Vogel tribes their shell work. For a big feast or ceremony, as the mourning meal at Ganjiga shown above, there will be a great number of clay pots lined up and looked after by the women, while the young men help out with shredding coconut and the elders sit and discuss clan matters. 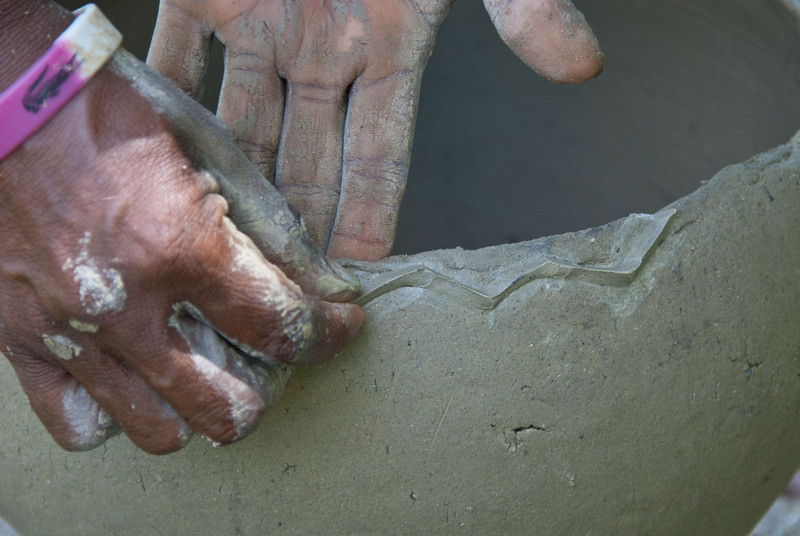 The ‘bible’ on this topic, “The Traditional Pottery of Papua New Guinea” is written by Patricia May and Margaret Tuckson. 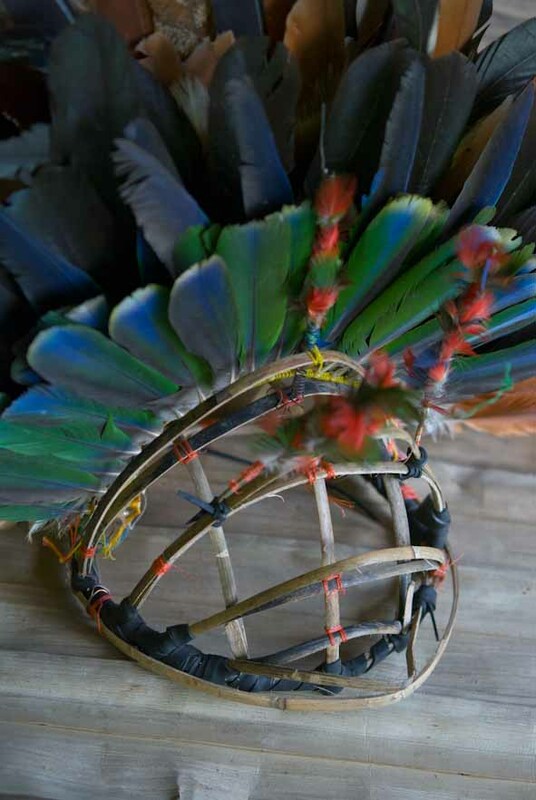 When the steady rhythm of the kundu drums sound and the dancers move around in lines and circles, finding the right steps to the songs, one can’t help being captured by their amazing head dresses. 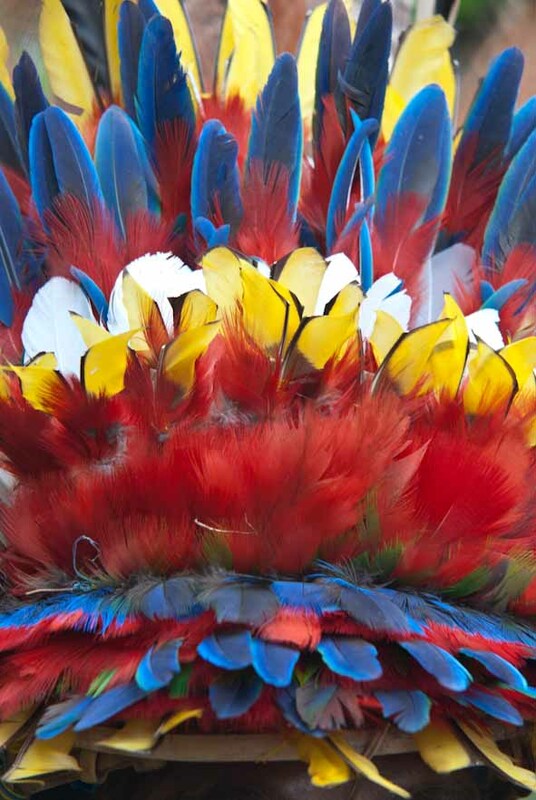 The expressively colourful feather arrangements light up the dancing ground; the cassowary plumes down the back sway to the beat; rooster feathers wave from the tops. 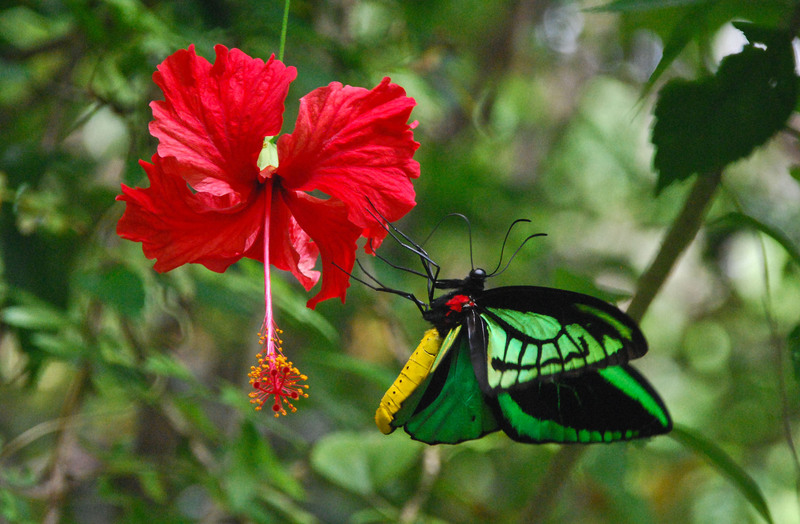 It’s an explosion of colour and movement. Much of the old style of the headdresses has been kept through the years but some changed have been introduced. 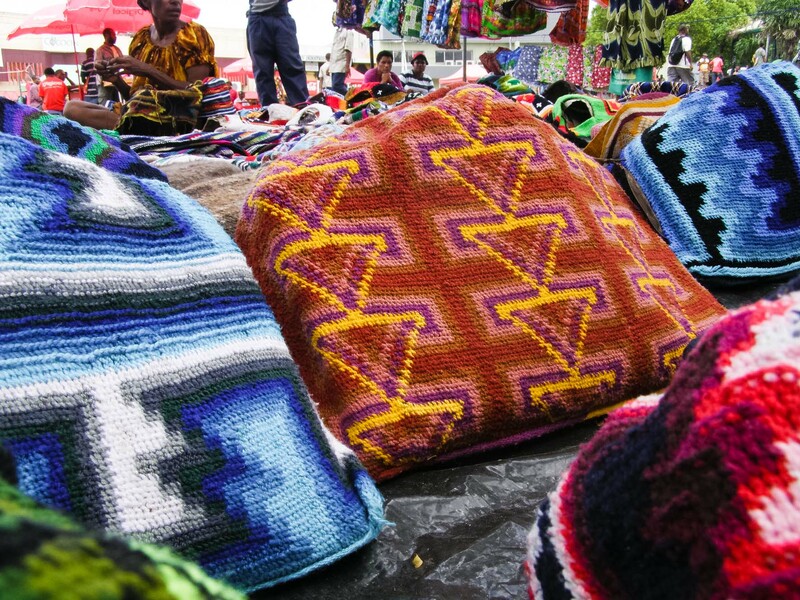 New Guineans have never been afraid of picking up new ideas and inspiration from others and the decorations are also, to a large degree, individual expressions. When Roy makes his head dress ready for a dance he brings out his little suitcase where he keeps his feathers carefully and neatly stacked. They are all strung up in rows of similar feathers – some are very old. He then finds his helmet-shaped frame, and start tying one row of feathers in front of the other. Maybe he will arrange it just like he did last time or maybe he will try a new combination – he’s got a lot to choose between. Roy has a liking for the blue and red feathers from the female Eclectus parrot, and he combines them with others from lories, lorikeets, kites, and the white cockatoo ones that have been cut to zig-zags. Then come the orange plumes of the Bird of Paradise, the big dusk of cassowary feathers in the back, and finally – since he belongs to a chieftain clan – the black rooster feathers. While some of his brothers stick to the more traditional styles, Roy always looks for an interesting new and attractive combination – he knows that it will be noticed. 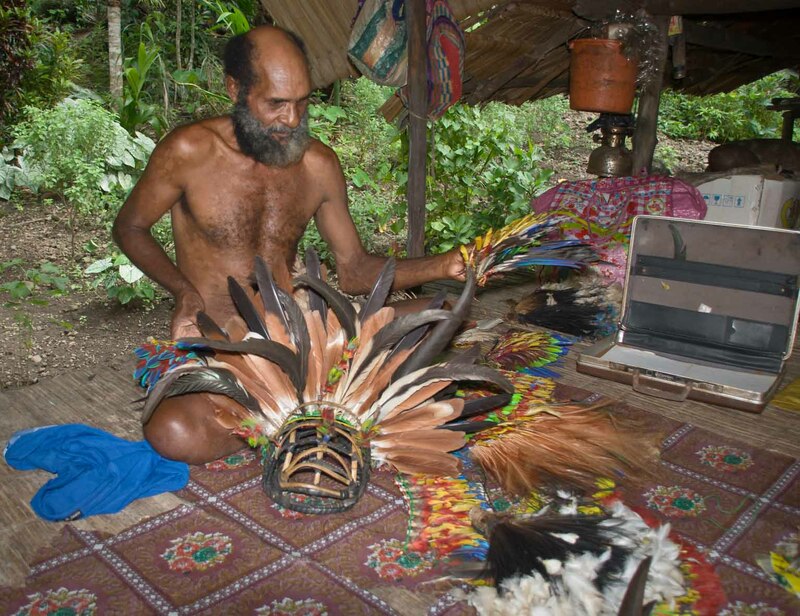 This type of head dress is common, with local alterations, in most of Oro Province, and also down the coast to the area around Rabaraba, and they won’t disappear. 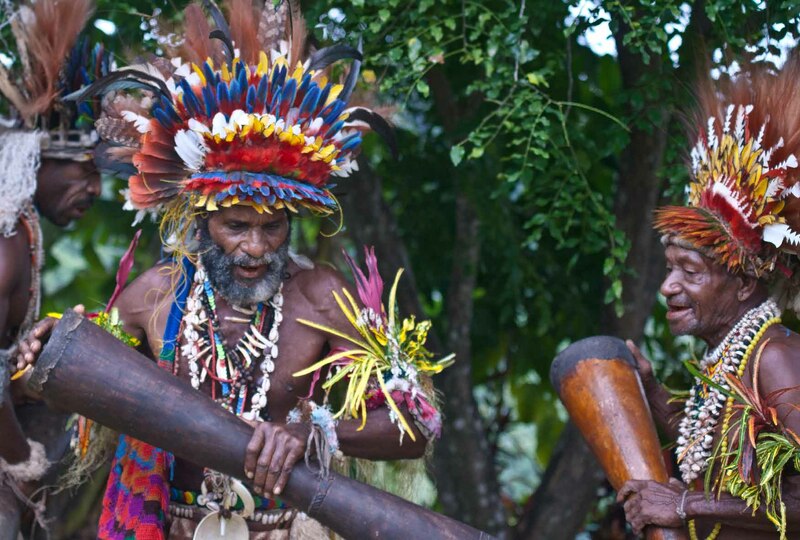 Many of their songs and dances are important parts of the clans’ and families’ oral tradition, and for a dance only the traditional dress is appropriate. 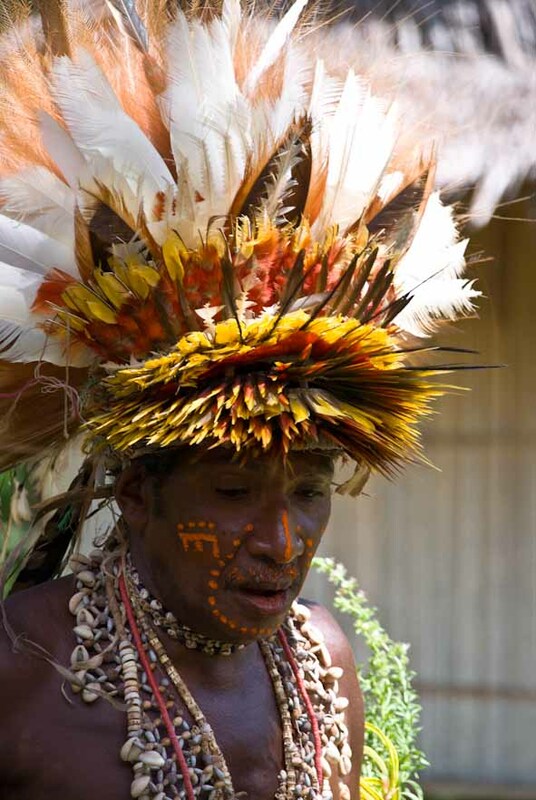 That means tapa cloth, shells and feathers, and they are worn with pride. 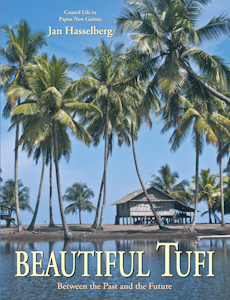 W ith this book I intend to show what life is like for the villagers of Tufi in Papua New Guinea. Very little has been written about this area before, so having been impressed with both the people and the place I figured it was about time for a presentation. 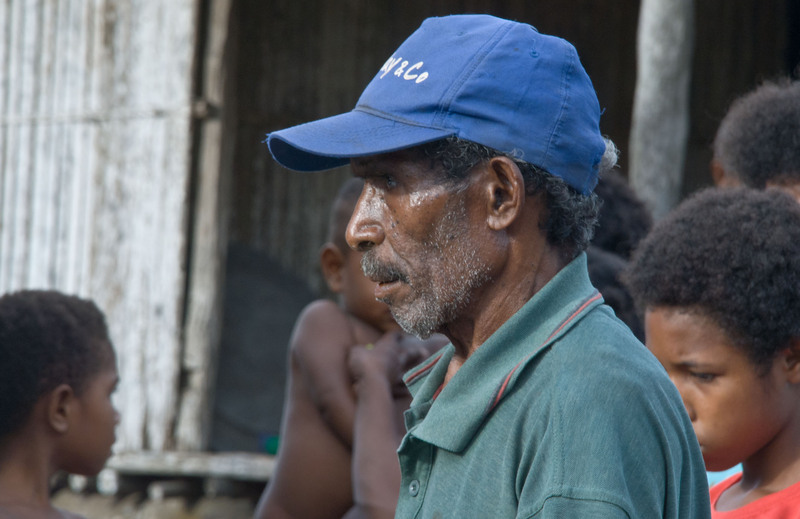 The people here are also quite representative for their country, living as they are in close contact with both the sea and the forests, and they are even ethnically a mix between the Melanesian and the Papuan groups. Traditional life is still dominating, but certainly not without influence and knowledge about the world around. 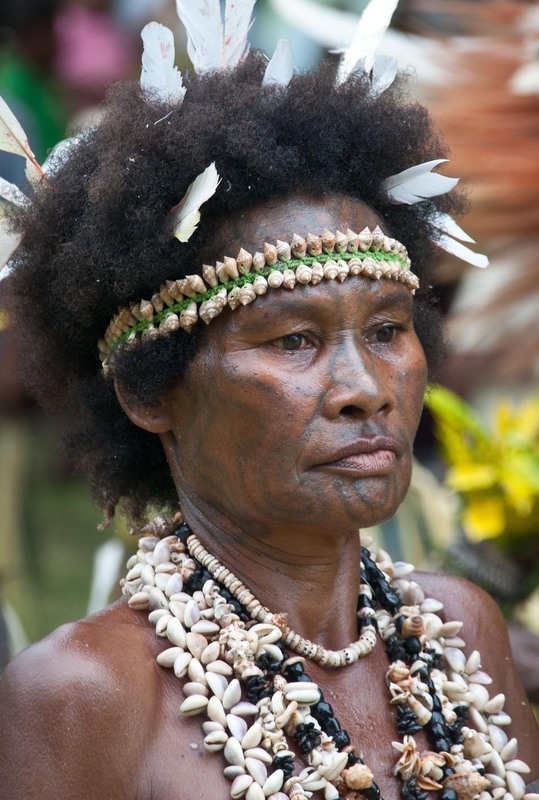 As with many other developing nations, much of the news that reaches the outside world about Papua New Guinea is of the negative kind, and the many misconceptions I have met with abroad has also triggered my inspiration to fill in some of the missing pieces. 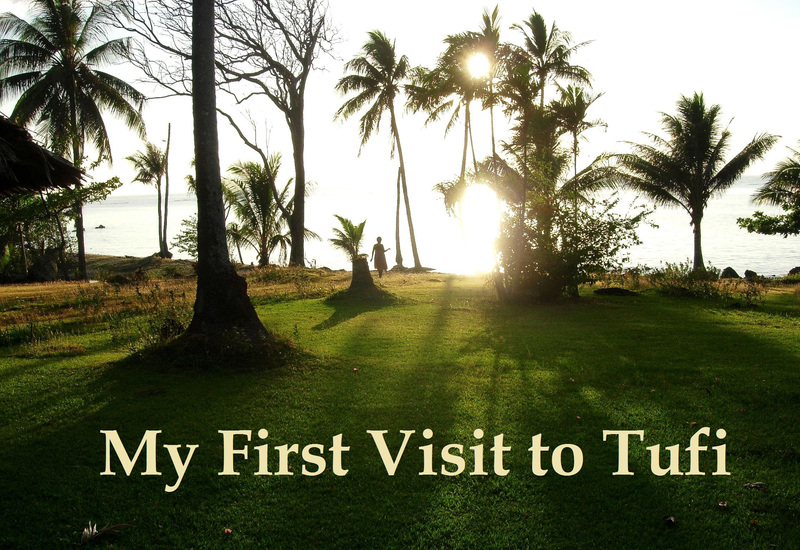 During my first stays at Tufi I had learned that the area has a very dramatic and interesting history and a great wealth of natural treasures. Then there was the warmth and hospitality that I was met with, and all this made it natural to go back and experience more of what ‘beautiful Tufi’ has to offer. The idea for the book developed slowly after my second visit to the area in 2006, and two years later I had started making serious preparations. 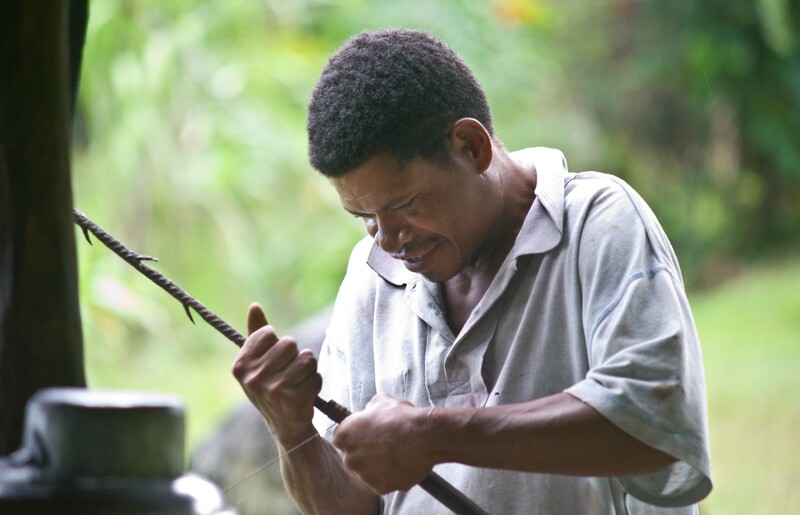 In 2009 I again widened my range and made many important contacts – I learned that the villagers were positive to my coming back for a more substantial project. 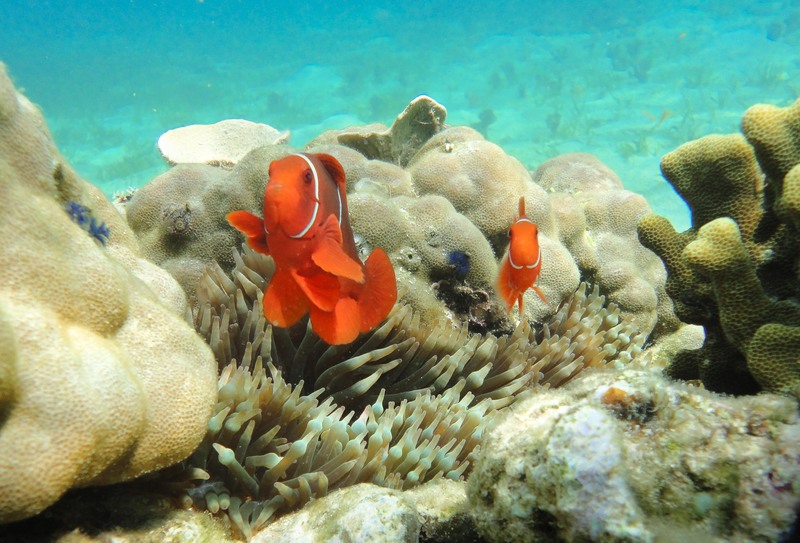 Between August 2010 and March 2011 I spent more than six months around Tufi, and also ventured a bit further down the coast to Collingwood Bay for a few weeks. 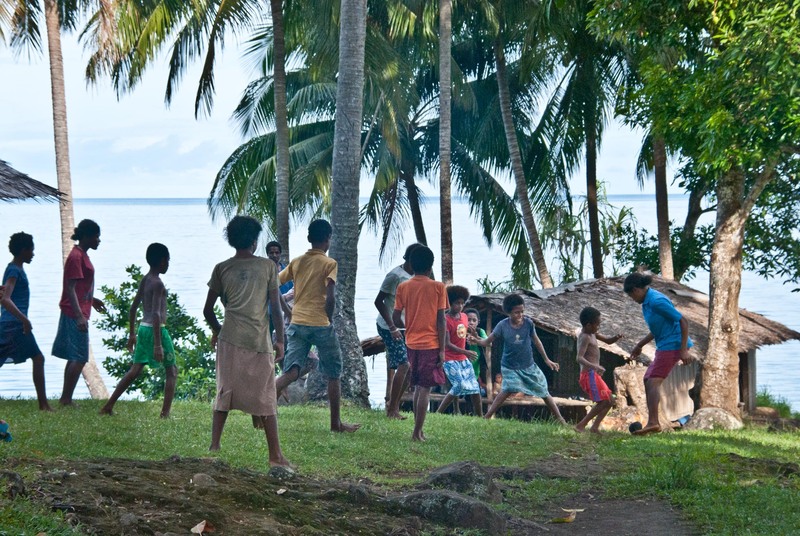 After many hours of story-telling in shelters all along this fascinating coastline; after long canoe rides and hikes through the forests; and after an endless number of wonderful experiences, I believe I have the material to give you an idea of what life at Tufi is like. 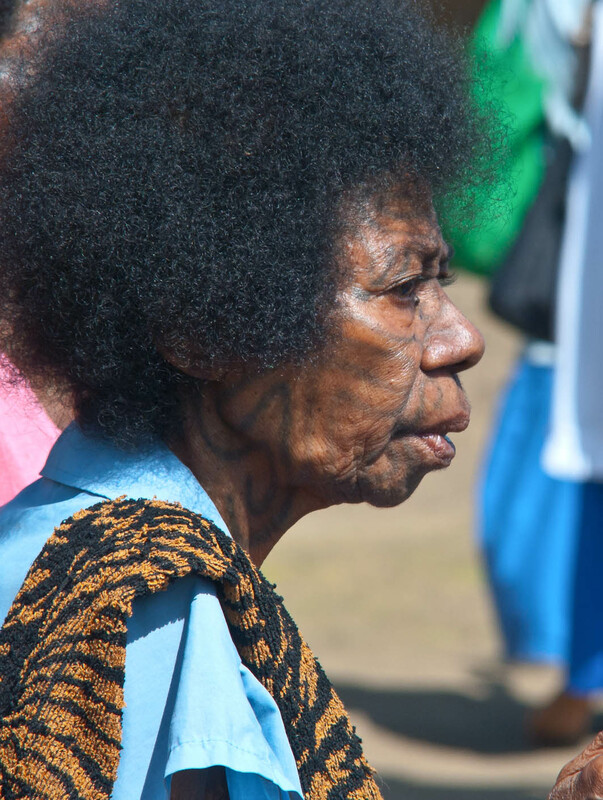 Colourful festivals; beautiful scenery; special wildlife; everyday situations – if you’d like to get an idea of what Papua New Guinea is like you should drop in to Flickr. Photos is the quick road to an impression. 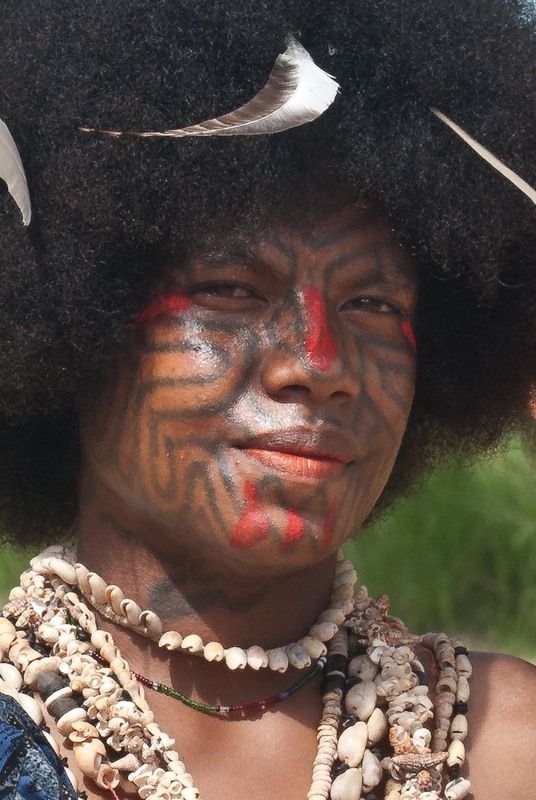 I have 800 some PNG photos there, and you can find thousands from other photographers (try Eric Lafforgue’s). Resort Relaxation or Independent Travelling? 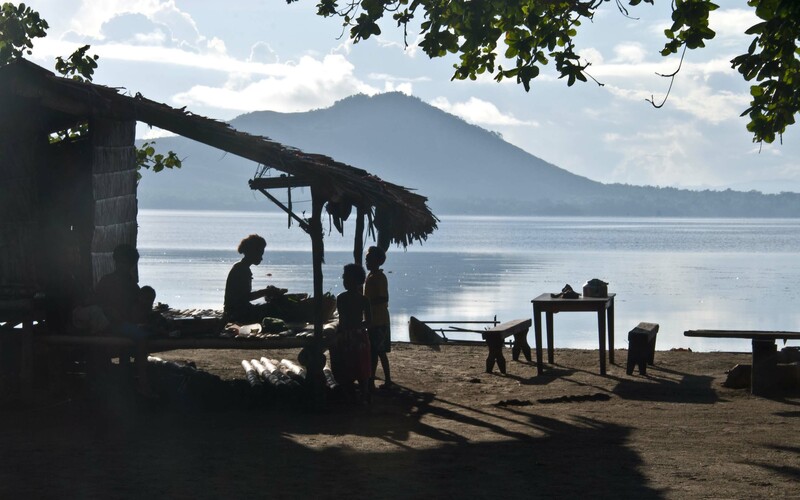 PNG is a particularly fascinating and quite unexplored tourist destination, a place many have on their wish list but might be uncertain about: Is it difficult to get around; does it need to be expensive; do people understand English; should I leave to others to make all the practical arrangements? check out what suits your budget. 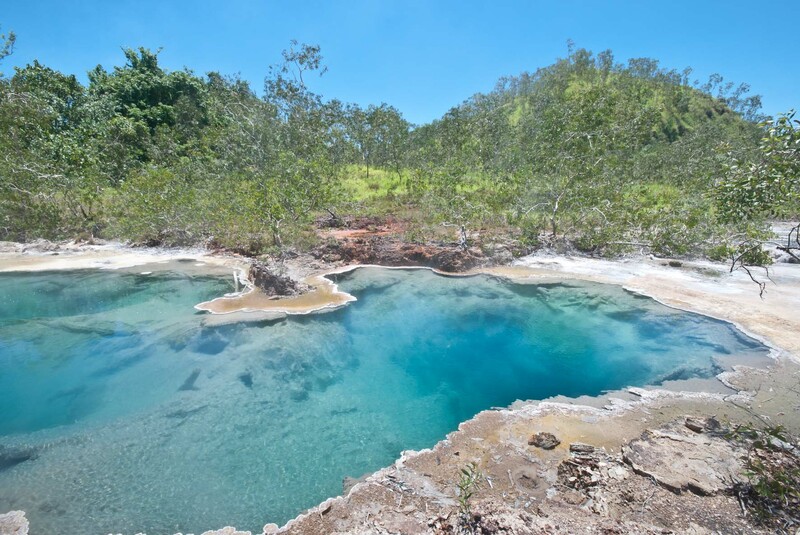 If your plans are a bit more flexible, as mine have been, you can aim for a spot, book a few days at a hotel or resort, and then make arrangements with local people to visit special sights and places: villages, islands, waterfalls, bird watching sites, etc. 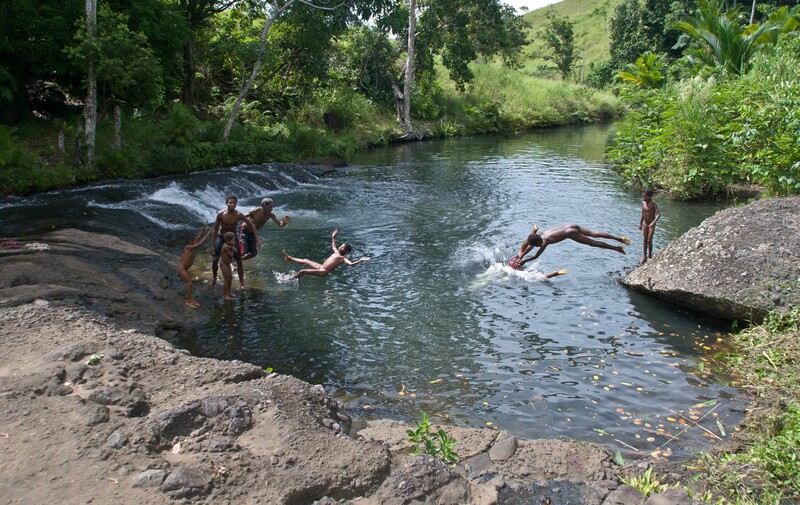 Tufi is an ideal spot for this kind of travelling, and for me this has been a successful approach around Lae and Alotau as well: Kamiali and Salamaua south of Lae and the hot springs and villages on Fergusson Island are among the treasures in my travel scrap book. A convenient feature for most of us is that English is spoken and understood pretty much everywhere. 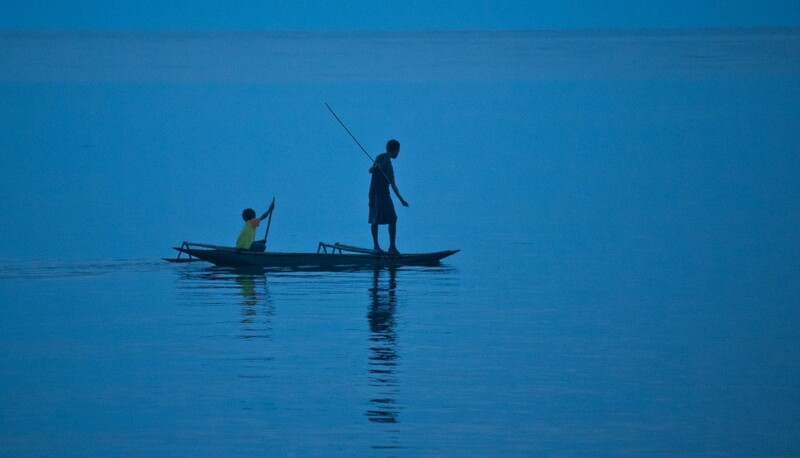 On the negative side are the fired-up hotel prices in Port Moresby. It’s not a bad idea to move on straight away on your arrival in the capital, but when returning you should book a night to be on the safe side – weather or other circumstances sometimes causes delays on domestic flights. Rather than overspending in Moresby I prefer to spend an extra night at a pretty and relaxing resort or spend some extra in the villages. When in Port Moresby I usually stay at the reasonable and well-run Comfort Inn. 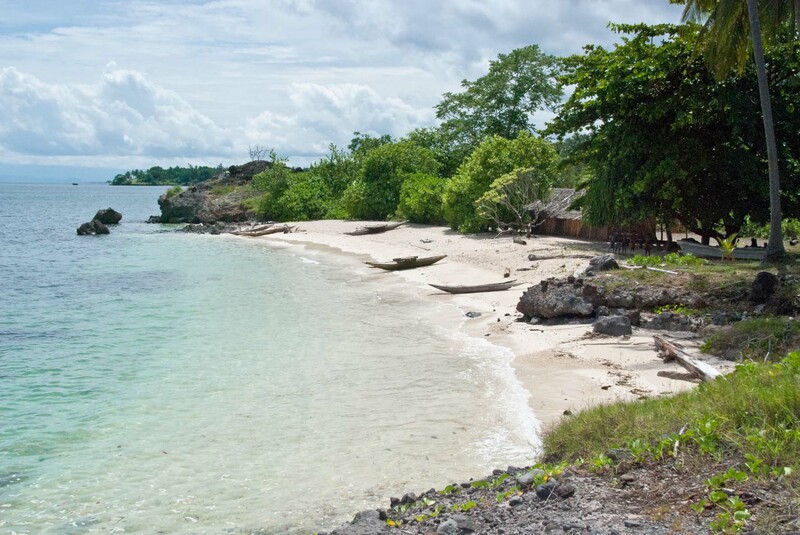 Another good (but more expensive) alternative is to book at Loloata Island Resort just south of town. Try out the village guest houses! There are many all over the country, and I believe Tufi has the most. These are basic, bush material houses, but full catered and including transportation and guiding services; most of them need a day or two’s notice for preparations. 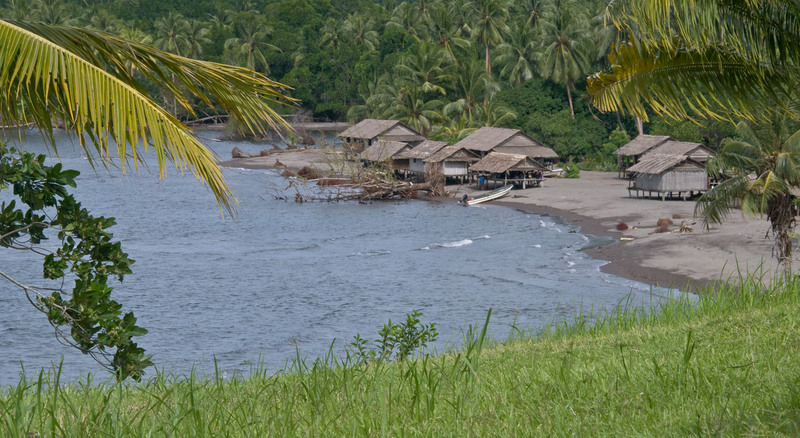 At Orotoaba (Tufi) I’ve had a morning Bird-of-Paradise walk followed by a lobster brunch; at Kamiali (Morobe) I’ve spent the sun rise hours paddling up a tranquil river; at Waluma (Fergusson Island) I’ve snorkeled by underwater volcanic vents; and at Angorogho (Tufi) I have climbed up to a hidden skull cave. My list is endless and spectacular. When I travel I bring out my camera for a photo when I see something interesting or unusual, but most of all when I find something to be beautiful. Sometimes a majestic view or fascinating scenery; sometimes a colourful detail or a special line or figure; and sometimes I attempt to capture a beautiful mood or atmosphere. Sometimes a smile. 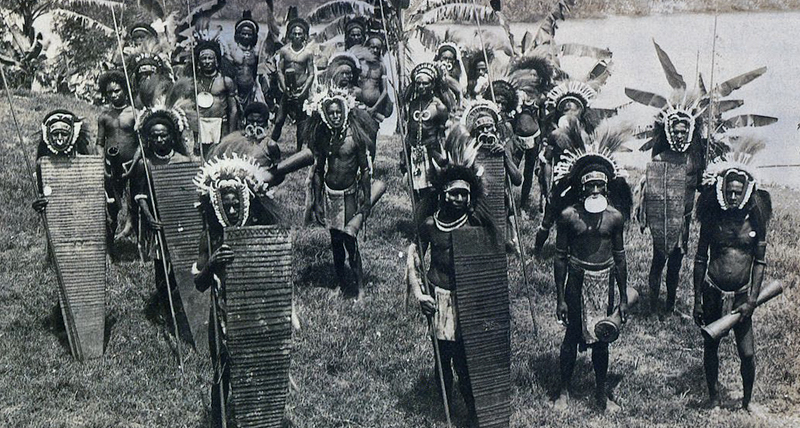 Okeina warriors at a peaceful ‘singsing’ at Tufi, early 1900s. This is how the chapter of the big Korafe migration starts in my Beautiful Tufi book. It think my idea of writing this book started to take shape when I realized that Tufi has a very dramatic history. 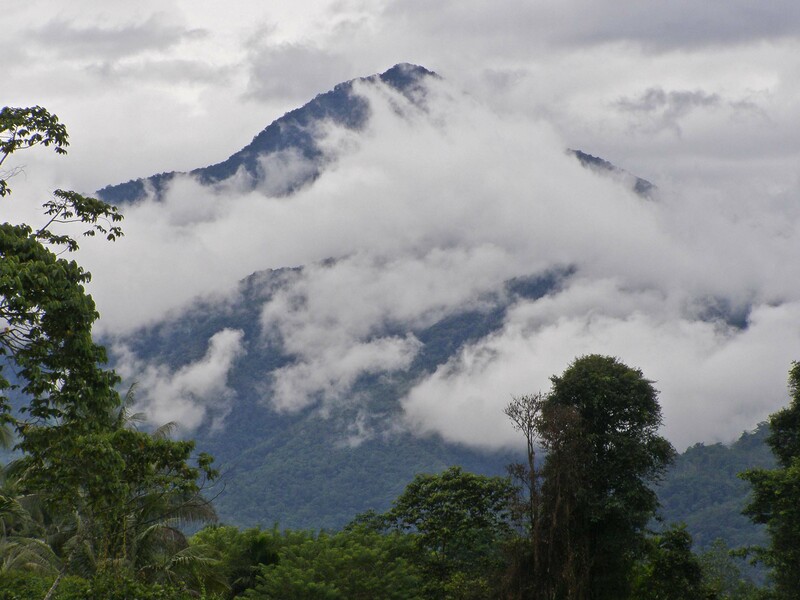 Here were not only a beautiful place with wonderful people, but here were also stories from World War II, from the devastating cyclone that hit the area in 1972, and then from the pre-colonial days when tribal warfare, cannibalism and migration were part of what people expected to see in their lifetime. 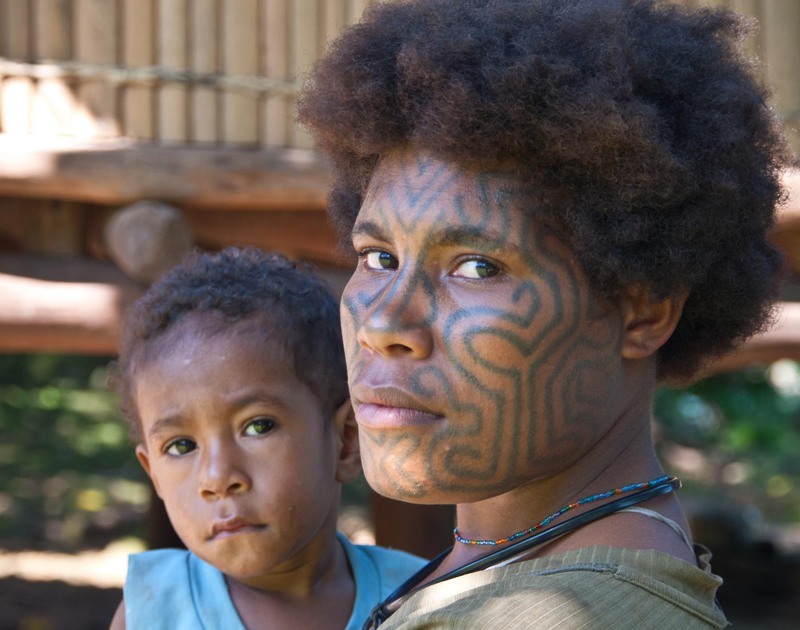 There are several tribes (or groups) around Tufi, speaking different languages, and they are again divided into a great number of clans. Each clan carries the stories of their past, so the big story of the great migration is a conglomerate of stories from all clans. It’s a story of how bigger and stronger groups have expanded into the area, pushing others against each other, and sometimes even killing them off completely. Some were forced to move, sometimes for forever and sometimes for a later return. Today the spears are only prepared for hunting. The Korafe were a big group with many clans that set out across the pass between the Keroroa and Yamewara mountains (Mt Victory and Mt Trafalgar in English) and then lived for some years here and for some years there, finally finding their way to the Tufi fjords where they still are today. Around Tufi the found another people, lower in numbers and weaker, and these they soon dominated, meaning marrying their women and killing their men. It’s part of history now. Here, behind Spear Point, the fighting was fierce in the time of the tribal wars. 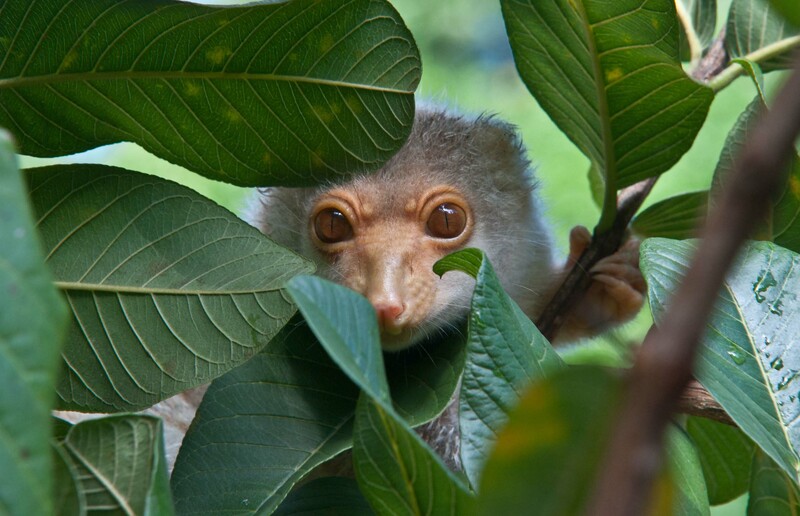 Read more about Beautiful Tufi here! We are sitting on the porch of Benson’s auntie having a well-deserved rest. 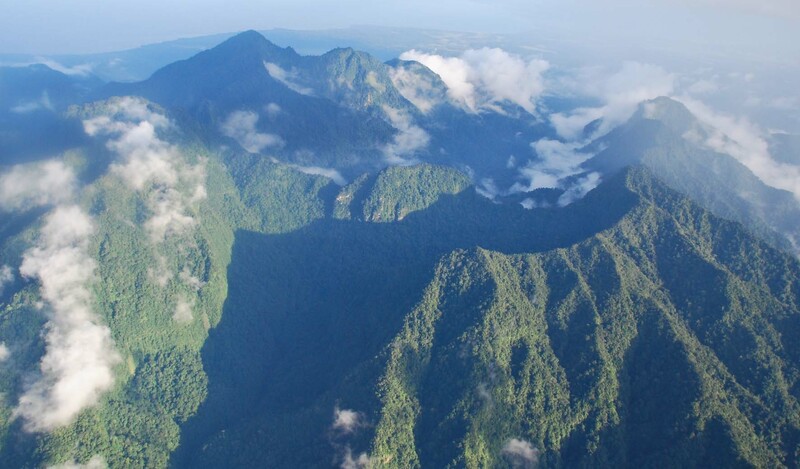 I turn my head – the view from up here is as promised: absolutely gorgeous. 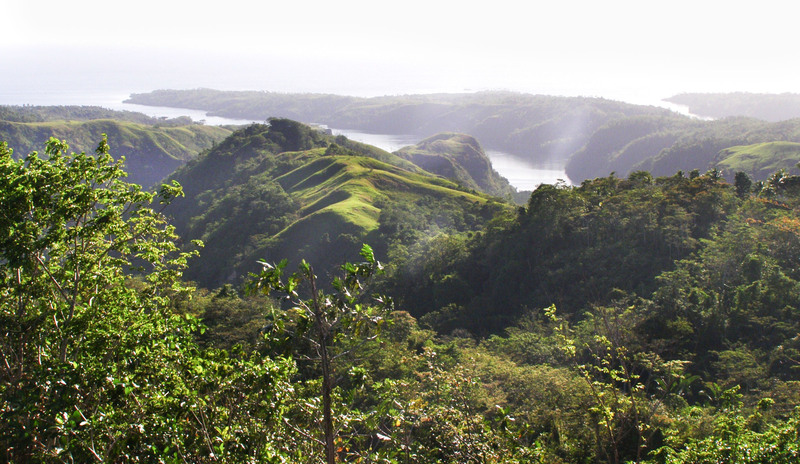 The green ridges that line the fjords are stretching out toward the Bismarck Sea, parts of them covered with kunai grass, and parts of them forested. The sea is shimmering along a wide horizon. This was back in 2005, and here from Kikita, high on the ridge behind the fjords, I had my first panoramic view of ‘Beautiful Tufi’. The walk up there, through the band of pretty, small hamlets, was the highlight of my first Tufi stay. It was a short stay, only five-six days, but I had the feeling already before arriving there that this would just be a first glimpse; an entré that would be followed by longer and more adventurous visits. I should thank my sisters and brothers-in-law down in Queensland for giving me the idea in the first place. 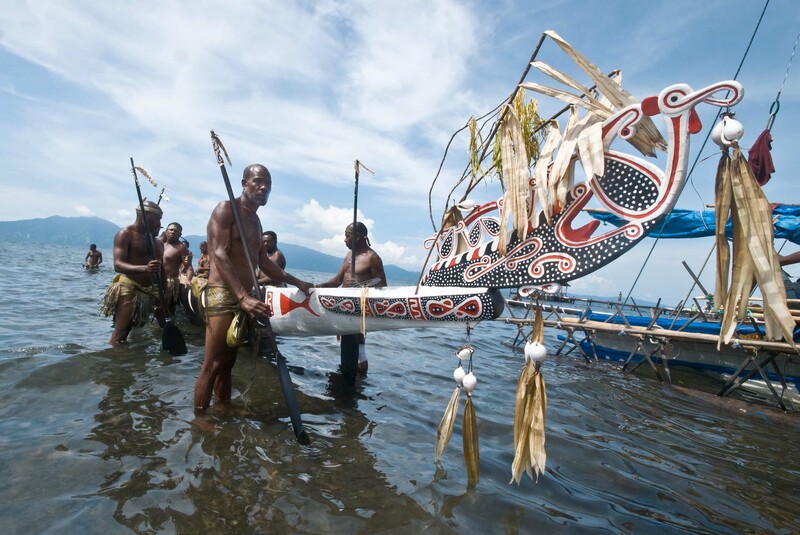 Through them I knew that Papua New Guinea was not at all inaccessible, and since I was looking for a culturally exciting place to visit PNG was a natural pick. On the Internet I found my way to Tufi, with a small resort and possibilities for village stays. And so I took off. 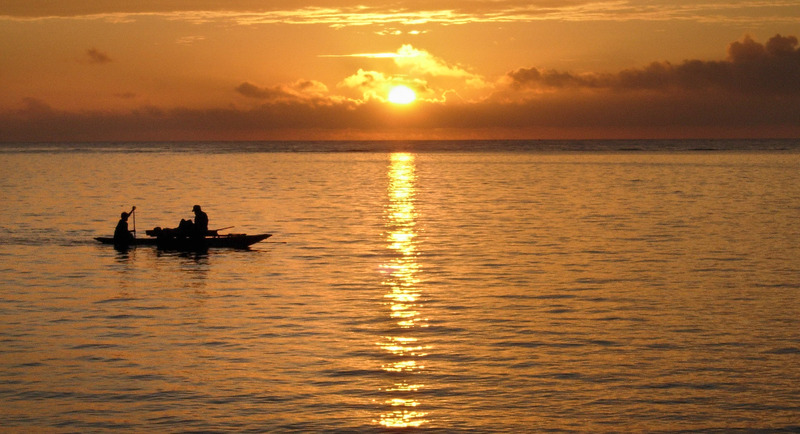 Paddling along coconut-lined beaches in traditional outriggers; stopping for a chat in villages and hamlets; getting to know people who were both interested in telling their own stories and listening to mine – this all made a deep and positive impression on me. I wanted to see more; I wanted to hear more. 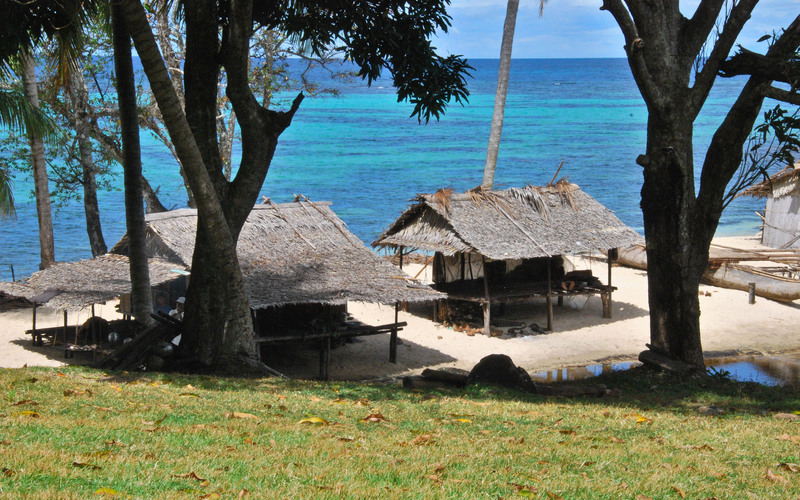 Another of my memorable first-visit impressions was waking up to a beautiful sunrise on the beach just below the guesthouse at Kufure village. There I was also well taken care of by Davidson (in the photo below) and Erwatius, by Bona, Champion and Benson, and this is one of the reasons why I let my book both start and end at Kofure beach. The first paragraph here is from a little story that I wrote about my walk to Kikita for my old travel web page. If you’d like to see the whole story you click here.